Clicking the Archive button from the Current tab acknowledges and archives the issue and removes it from the current list. Indeni stores all resolved issues. These are placed under Current Issues until they are manually acknowledged. There is no aging algorithm. To review issues acknowledged, go to the Archived sub-tab. Use the blue arrow to edit or filter issues for individual devices, group of devices, type of issues, type of severities, resolved or unresolved issues. Issues that are resolved are greyed out. The checkboxes in the left column allow users to manage multiple issues. Use the topmost checkbox (in the header row) to check or uncheck all boxes at once. You can archive multiple issues. The general functionality is the same as Current Issues. The ID column contains will display the severity type based on the color flag and initial of each issues. 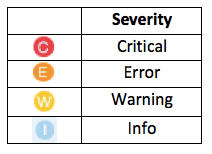 Colors range from red to blue to distinguish critical warnings from less severe issues. 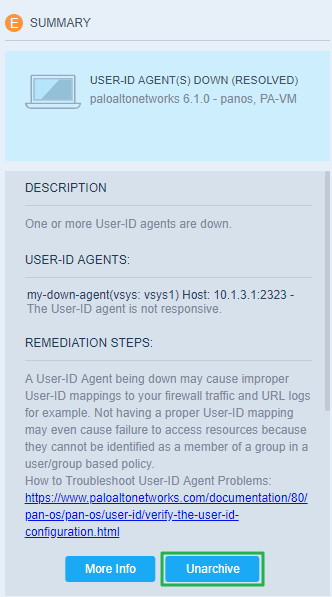 This allows users to find and resolve issues most likely to cause imminent downtime and to visually assess the type of issue and remedial action required. Indeni assigns unique number to each issue as it occurs. By default, issues display in descending order of severity and by date modified. The Headline displays the actual issue information and a brief description of the condition Indeni has observed. The Device IP column displays the device management IP address assigned to each device for which an issue has been flagged. Device column displays the device name assigned to each device for which an issue has been flagged, followed by when it was Created and last Updated. The user can Unarchive an issue in the Issue Summary. The issue will return to the Current issue list.